Danny De Vogelaere was 11 years old when he first started serving tables at the Siphon Restaurant in Damme. They didn’t have a uniform in his size so one was made especially for him. Thirty-four years later, he’s still serving the specialties of smoked eel and wild game to regular clients and international visitors. Danny’s story is a common one amongst the staff of the Siphon. In 1902, Franciscus Callewaert opened a small fisherman’s café where the three canals in Damme meet. The café—originally called “Au Repos des Pecheurs”—hosted fishermen who did little fishing, but plenty of drinking. When Franciscus’ son Jan Callewaert married a daughter of the local Broucke family, the vision and hard work of Yvonne Callewaert—referred to affectionately around the restaurant as the “de bonne maman”—transformed the small café into the restaurant that is the Siphon today. Stories abound of her working day and night since the 1950s, 365 days a year, serving sandwiches to drunk fishermen at 3am, growing the kitchen and building relationships. When Yvonne’s son, Franky Callewaert took over the business, he continued to strengthen all the values that had seen the restaurant thrive under his parents. Tradition was key, not only on the menu, but in the small touches like the checkered tablecloths and classic décor. Quality was at the heart of every decision, with high quality meat cooked over an open fire, wild game plucked on site, and the eel smoked in a hut on the grounds of the restaurant. There were many famous visitors. Jacques Brel ate at the Siphon. Raymond van het Groenewoud got married here. When King Albert II and Queen Paola entertained royalty from the Scandanavian countries, they chose the Siphon as the restaurant to host. In 2013, three things happened: Firstly, the respected global lifestyle magazine, ‘Condé Nast Traveler’ listed the Siphon as one of the Top 25 Best Neighbourhood Restaurants in the World. Secondly, the family decided—for the benefit of its staff—to close at the weekends and open only from Monday to Friday. Thirdly, Jan Callewaert—named after his grandfather and aged 25 at the time—became the fourth generation of the Callewaert family to manage the Siphon. 1902 is a beer to celebrate the rich history and continuing culinary excellence of the Siphon restaurant. The visual identity of the beer is the “Monnikenrede” symbol which appears on every plate and every cup in the restaurant, a nod to the historic village which existed at the site of the Siphon in the 1600s where religious groups would welcome eel fishermen should they need somewhere to stay. The beer is a classic Belgian style—a golden Tripel of 8,5% ABV—but with the individual stamp of Siphon Brewing. 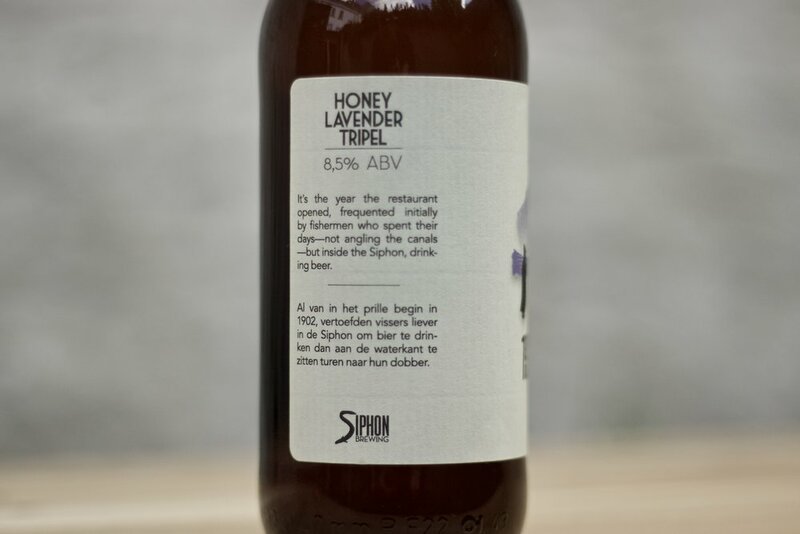 The addition of honey accentuates the rich nectar-like maltiness of the beer, and the distinct aromas of the lavender compliment both the floral, earthy hop profile and the banana-esque, apricot yeast flavours.